A rifle scope is an important device that you need if you want to achieve long-range accuracy when shooting. If you are an avid hunter or a rifle owner, you not only need to know how to install a rifle scope but also how to sight in a scope. Sighting in scope can be easy for some people while others find it pretty tough. However, with more practice, you will be able to sight well. Once you master all the basics required in sighting in a rifle scope, everything else comes naturally. When you are hunting and your rifle scope is not sighted properly, there are high chances that you will miss your target. This is why I have created this guide to help you learn the important steps that will help you sight in a scope. It doesn't matter if you are using a handgun, shotgun or rifle, these tips will help you. This is the first thing that you should do. 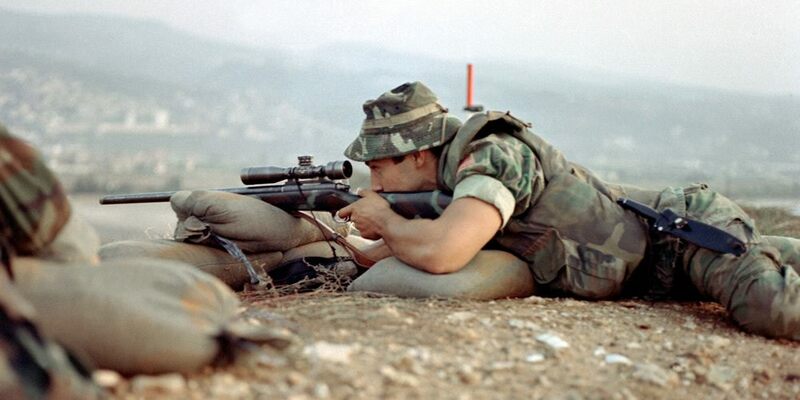 You will note that most rifles are equipped with a mounting place for the scope. It doesn't matter if your rifle is made with pre-drilled tapped holes or a grooved rail system, you should make sure that the scope mounts properly and the rings fit the style of your rifle. You should be aware of matching components because some types of scope rings will only fit well on specific types of scope bases. Once you have mounted and adjusted your scope properly, you need to determine the distance that you want the scope to sight into. In this case, I would recommend a distance of between 50-100 yards. If you want to zero your rifle at a longer distance of between 200-300 yards, the best thing you can do is to do the initial sight-in at a short distance. After you have installed your scope properly, the next thing that you should do is to adjust the eye distance. Make sure that the eyepiece is located in a way that you can see clear and distinct images. It is crucial to fine tune the scope and come up with an ideal eye relief when you are sighting in a scope. The eye relief, which is the distance between the end of the scope and the eye should be far enough. This is important because when you are shooting, the recoil should not send the scope far enough to get into contact with your eyes which can lead to injuries. If you want to sight effectively on your rifle scope, you need to get level. A stable shooting position is required so that you can shoot accurately. Look for a convenient place to keep your rifle such as a shooting bench that has a mount or bipod depending on what you want. Having a rifle mount is important because it reduces recoil up to 95% while holding your rifle securely on the target. You can get different types of rifle mounts on the market today at different price ranges to suit your budget. Make sure that you choose one that is specifically made for sighting in a scope. You can also choose to buy a shooting bench because it will help you balance the firearm and give you the accuracy that you need. In most cases, shooting with your rifle is hardly done when you are standing up, this means that you need to have a good resting place for your rifle. This is one of the most important things that many shooters do not take into consideration. Aligning the reticle is crucial because if the crosshairs of the scope are not aligned properly to the direction of the windage adjustment and elevation, you will end up with a reticle cant. This will force you to miss your targets either right or left more so if you are aiming a target that of 250 yards or more. To set your zero can involve a lot of processes and you should also make sure that the rifle is in a stable position. If you are at an outdoor shooting range, you can find it pretty simple because you just need the target set at various distances of at least 100 yards. In most rifle scopes, you can adjust the crosshairs in ¼ minute of angle increment. This is equal to ¼ inches of movement per every click when you are sighting in at 100 yards. The next thing you need to do is to fire 3 shot groups and check where the groups land the object you are targeting. Depending on what you want, you can choose to sight at 100 yards or shoot dead center at 200 yards. If you know your minute of angle, then it will be easy for you to adjust your target and various distances. Try various distances repeatedly until you reach a point where you can hit grouped shots consistently even near the bullseye. Once you do this, you can now train to hit targets that are far. When doing this, you not only need to consider the target distance and the rifle scope but also other environmental conditions like the wind. Hunters and shooters should not only invest in purchasing the best rifle but also a quality rifle scope. Mounting a rifle scope on your rifle helps you achieve precision and accuracy when you are shooting your targets. After all, your main objective when you are in the field is to shoot your target in less time and with minimal attempts. Having a rifle scope gives you a higher accuracy level as compared to having none. Form the above guide, I believe you will find it easy to sight in a scope especially if you are a beginner. I have provided you with a step by step guide to make your work easier. You can follow the above tips and you will be able to aim at your targets better and achieve accurate shooting.